Back in the 1930's, Australia was trying to deal with sugar cane beetles which were destroying their crops in the Northern, more tropical, parts of the country. In 1935, after some questionable research, someone thought to import about 100 Cane Toads (Bufo Marinus) because they supposedly would devour these beetles. Researchers soon discovered the beetle population was not declining as planned but, instead, the population of Cane Toads started booming. Turns out, the toads couldn't jump high enough to catch the beetles and there was plenty of easier prey to get at their ground level. To make the Cane Toad problem worse, there are no natural predators of the toad in Australia. In fact, if one of Australia's many unique creatures decides to try to eat a toad, they themselves will die from the very deadly toxins found in the body of the toad. The Cane Toad has now become a pest all over Northern Australia -- the original 102 toads now have over 200 million descendants overrunning the country. 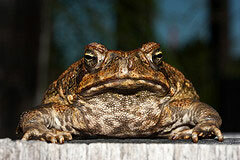 The cane toads can live for 40 years, grow to 10 inches (25cm), and weigh up to 5 lbs (2.3kgs). Ranging in size from small to extra large — think of a soccer ball with legs and a head — people are now becoming quite creative in ways of handling the “new” pest. While in Australia, on our honeymoon over 20 years ago, we "discovered" Cane Toad leather products while shopping in the Kuranda market north of Cairns. The skin of the Cane Toad is strong, tough and durable which makes great long-lasting gift items. Finally, Cane Toads have been used for centuries by Chinese medicine in the treatment of cardiovascular diseases and cancer. There is talk of a new farming industry in Queensland where they would start "harvesting" Cane Toads in high volume for production of therapeutic medicines. If this should come to pass, then the gift items sold here may become very rare and hard to get. Recently, a great article with lots of facts came out in the Brisbane Times about our friend the cane toad. The article is titled "80 Facts to Mark 80 Years of Cane Toads". Wikipedia, of course, also has a thorough article on Cane Toads in Australia.